When people ask me “What’s your novel about,” I usually say it’s a teenaged Orange is the New Black –the Netflix version, not the book- featuring a naive 17 year old mother who’s an immigrant. I’ve been asked, by YA author Evelyne Holingue, to talk about the characters in my YA novel. Her novel, TRAPPED IN PARIS, took me on an adventure through the streets of Paris.Evelyne continues to take me on an exciting jaunt through her blog and now through the Meet My Character blog tour. I’m so glad she asked me to join the tour. In case anyone wonders, I began writing this novel in 2008 before OITNB was published. I wrote it based on my 28 years experience working within the California Department of Corrections. 1. What is the name of your character (s)? Is he/she fictional or a historic person? Juana Maria Ivanov is the fictional main character. She frequently has a look on her face just like Piper in the photo above. The similarities end there, but the description gives people a quick picture. Juana is younger, Mexican, and without Piper’s resources or language skills. And, she is not like the Latinas featured in OITNB. The antagonist in my story is Jester, who is one of the gang leaders. Juana’s friends are two outsiders, one an idealistic protestor and the other a pastor’s daughter. The story is set within the twelve foot chain link fences of a correctional facility in California in the late 1980’s. This was the time of “Lock ‘Em Up,” laws and when there was little recourse or rights for teenagers in the criminal justice system. Sentencing laws and due process were different for young men and women under the age of 18 years old. Sweet, helpful and unintentionally funny, Juana is basically an optimist. Sometimes these qualities don’t serve her. She thought she was going to be part of the American dream when she married her first sweetheart, nineteen year old Alek Ivanov, a first generation Russian American that she met while working in a border town. When she has her baby, they move to Los Angeles where she learns that he is abusive, more so when he is under the influence of alcohol. 4. What is the main conflict? After a beating, Juana runs away and takes her baby to her sister. When she returns she is arrested for Alek’s death, convicted of manslaughter and given a six year sentence. She is heartbroken over his death and leaving her baby, who she is certain will forget her. She desperately wants correctional staff to believe that she didn’t leave her husband to die, but she has no evidence except her word that he was alive when she ran away.When she finds out that her sister can no longer care for her baby and her mother-in-law files for custody, she has to find a way to keep her child. Figuring out how to survive prison, learning whom to trust, how to find help and how to stay strong are Juana’s goals. STONG WOMEN GROW HERE is the working title of this fictional novel. To download a free 17 page excerpt you can use this link. SWGH is a quarterfinalist in the Amazon Breakthrough Novel Award contest. Semifinals are in late June 2014. There’s no definite answer on this one. If the story is picked up by Amazon it could be published within a year. If it’s not a finalist, I hope to find an agent to represent my novel. Now I’m tagging Jennifer J. Chow, author of the award winning, The 228 Legacy, who is now typing away on her next novel. Make sure you check out Jennifer’s post on June 16, 2014. She has an adorable protagonist and I hope you will stop by to read about her story. For the past few weeks, I’ve written about my past career with the California Department of Corrections and Rehabilitation, Division of Juvenile Justice. It’s a state agency that oversees more than 162,821 prisoners within institutions with an additional 91, 700 more offenders on parole. My intent is to give a very small view of the world that is foreign to most and share some lessons learned from my experiences from life inside youth correctional facilities from 1980-2008. In past posts, I talked about female offenders as the fastest growing prison demographic in the U.S and gave some of my career backstories. My training involved several stages with the main value gained by on-the-job training. Listening to staff and female offenders was helpful too. My college degree was the least helpful except when it was time to write case reports. There are three photos here. All look like the typical teenagers that I worked with in prison. Can you tell which one committed murder, assault with a deadly weapon, drug trafficking? Sorry, no points given for correct answers as you may recognize two of these young women from recent newspaper articles. The point is that many female offenders looked like these girls but were in for some heinous crimes. As a staff member, a woman, and not too distant from their ages at the time, it could be easy to forget that the offenders were some very troubled people. After I returned from the Academy I was assigned another young woman to my caseload. She had to be reassigned from her Youth Correctional Counselor who transferred. The caseworker pointed to a girl in the dayroom. She looked older than the rest and with her long dark hair, pretty face, and eager smile she looked like a college sorority girl. The caseworker said the girl was enrolled in the community college program within the facility. “Sure, no problem,” I said. I didn’t have time to read the girl’s case file. It was time for weekly small group and I assembled my caseload of gangbangers, drug offenders, and thieves. One girl moved her chair away from the college looking ingenue when she sat down. Throughout the group time, I caught the drift that the college girl wasn’t disliked but feared in some way. She seemed intelligent, minded her own business, and paid attention although she didn’t interact with anyone. After group, I walked my girls to their rooms, unlocked their doors, and locked them back in. The ingenue had the room closest to the top of the hallway and I locked her in first. When I locked in the last girl, she turned to me and said she didn’t want to be on my caseload anymore if the ‘satan-worshipping murdering’ so and so remained on the caseload. “As long as she doesn’t do that in group, she’s staying,” I said. “But you don’t have to sit next to her next time.” The girl looked relieved. I made a beeline to the staff desk and asked the other staff about the comment. “Yeah, didn’t you read her file? She’s famous, you know the girl from up north who….” Not only was she famous, her crime was infamous and the subject of books. A television movie came out after her release to parole. The lesson about not judging a book by its cover never had so much meaning. Have you ever come across a difficult situation where you learn a lesson? When you want to learn a new language, experts say that ‘immersion’ programs work faster and better than taking semi-regular classes. This applies to working in the law enforcement field. A couple of weeks ago I talked about the initial training I received when I began my career in corrections. Much of the training was OJT-on the job, not only training from other staff members but also the female offenders or wards, as we called them back in the ’80’s. The full immersion program is known as the Academy. It’s the same concept as a military boot camp or a police academy. You are there to learn discipline, the language, customs, and rules of the Department. Notice I capitalized ” Academy” and “Department.” That’s how certain things are referred to in quasi-military training academies. In this regimented world, you can bet that it wasn’t welcoming to women. Most of the women who worked in the prisons were nurses, teachers, social workers, or MTA’s (Medical Technical Assistant). It was a man’s world. And I don’t say this in a negative, judgmental sense. It is what it is (or was in those days). In my class, there were five women out of sixty men. An outcome of having few women in the Academy was that we were tested more often than men, to see ‘what we were made of.’ Consequently, we tried harder, sometimes acted more masculine than needed, and often times tried to outdo our male classmates. The Academy stressed that the trainers objective was to get a person ready to work in a high-stress environment as safely as possible. It was drilled into us that order and safety were the priorities. one of the instructors said. Made sense to me. After the first week, one of the women dropped out. The classroom lectures were reinforced by the dozens of ‘war stories’ one hears during breaks and from the veteran training staff teaching said, classes. The field trips to the closest correctional facility: Duel Vocational Institute-DVI, frighteningly referred to as “gladiator school,” further reinforced why one needed to pay attention in class, learn the self-defense techniques, proper handcuffing, and so on. Again, all this made sense to me as a twenty-one-year-old, that is until we were told about the tear gas shack. Say what? An older guy, in his thirties, told me that the trainers were going to herd us into a shack and then shoot tear gas through the open windows. His buddy, an earlier cadet, told him about the scenario. Don’t worry, I went through this in Nam. Piece of cake. “Oh, hell no.” I swiped a hand towel from the women’s bathroom and stuffed it in my pocket. The scenario played out exactly like my Viet Nam friend said. Twenty of us were herded into a 16×16 wooden building and told to line up against the wall-I was the first and only woman in the group. Two open windows were on opposing walls. “Where are our gas masks, sir?” a male cadet asked. The trainer smirked in response. My VN friend elbowed me and whispered “cover yourself as soon as you hear the shotgun sound. When you get outside, kneel down and take in some air.” I listened for the sound and ran like a bat out of hell. The tear gas stung like a swarm of bees. Immediately, the eyes and nose gushed with tears and mucus. I felt like dropping to the ground. My friend and I crashed through that front door first and fell forward on our knees, gasping for breath. So you know how it feels to use this on a human being. It’s not a toy. That was the best moral lesson I learned in the Academy. Treat others as human beings regardless of the circumstances. Sometimes you learn wisdom in the most roundabout ways, like in a tear gas shack. It’s a lesson I carried with me and hope I never forget. If you have any questions about life inside please share in the comment section. There has been an increase in T.V. female prisoner shows: Lockup, Cellblock 6 (TLC), Babies behind Bars (TLC), Beyond Scared Straight (A & E), and even Oprah’s OWN channel has Breaking Down Bars. 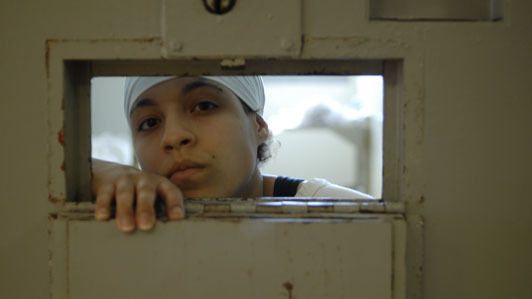 Women are the fastest growing prison population in America and some of the toughest to handle. 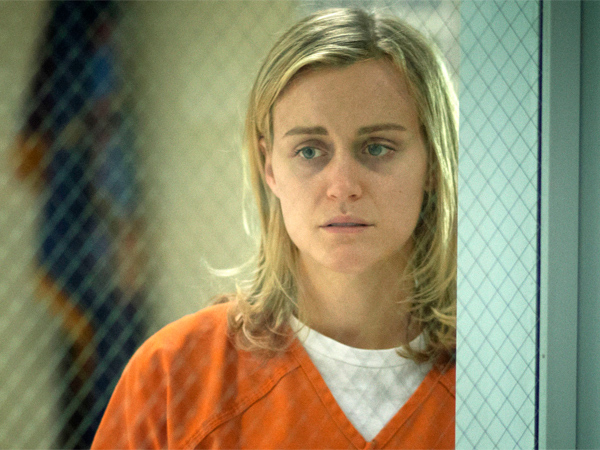 The subject of women in prison is a new one for this blog. After a year of posting I think it’s time I wrote about my experiences working in the Criminal Justice system. I spent 28 years working inside of Youth Correctional facilities in California and two years working at work furlough and prison pre-release programs, with male and female inmates, young offenders and older inmates. This has been a huge part of my working life. I can’t think of a ‘pretty picture’ to accompany this post so I chose the one that I feel is closest to the reality of life inside a prison. Granted, my life has been as a correctional worker, not as a prisoner. but I offer my perspective of women behind and in front of the cell bars. My career has affected me in so many ways that all three of my works-in-progress (WIP’s) are about characters on both sides of the law. One of the three WIP’s is set inside of a women’s prison and much of the setting is real, for that particular facility. For now I’ll begin with some background, not of my upbringing , but my career back story. In other words, how did I get from Catholic school to working inside of prison walls? After changes to my major (Psychology, Teaching, English) I found my niche: Sociology and Criminal Justice. During my Junior year I took a field trip to Lompoc Federal Penitentiary. It wasn’t scary until they let a large group of male inmates into the 16×20 conference room with two Correctional Officers (CO’s) a Caseworker and two teachers. It was like a show and tell about the programs inside. I was a shapely twenty year old with long hair to my waist. I felt naked as I sat on a folding chair and tried to make myself as small as possible. The teachers and Caseworker spoke and I heard the passion, and tiredness, in their voices. The passion was for the belief in rehabilitation and the tiredness was from the reality that everyone cannot or will not change. The ‘pitch’ was for student tutors, primarily for literacy tutors. I knew enough about the lives of drug dealers, con men and sweet talk that I was not going to volunteer for the program. During my Senior year I had more loans than scholarships and grants. I applied for a paid internship and that is how I ended up working with a Psychologist and two Probation Officers (PO’s) at a 90 day Pre-Release program for Lompoc Fed inmates. The staff mentored me and had me assist in their paperwork, especially the P.O’s. I spent eight months sitting in small group counseling sessions with a different group of eight parolees three times a week, the Psych, and one PO. I experienced the ‘games,’ got tough quick, learned the prison jargon, the Psych’s language, and the PO’s workload. My mentors recommended I go into Probation or work at the Juvenile Hall. I decided to apply at a Youth Correctional Facility in my county, graduated with my B.A.in June, and began working in July. I was twenty one years old, a new Youth Correctional Counselor, and my caseload of eight females ranged in age from eighteen to twenty-four. Most of them were older than me. The Youth Correctional Facility is under the Division of Juvenile Justice which is under the California Department of Corrections. There have been several changes throughout the years and the facility has housed ages 12-24 year old females to 16-21 year old males. It has been solely for girls and women, and then co-ed, back to all females 12-21 and now it’s coed again. The population has been as high as 1100 to a low of 230. Gender changes and population fluctuates in response to sentencing laws, prison overcrowding, and deteriorating structures. A prison is a world of its own. There are staff rules, inmate rules, gang rules, race rules and others that are best left for another time. Every Wednesday, my intention is to show readers this world, the girls and women inside (which I will refer to as female offenders), the sub-cultures, and the hopes and aspirations of young women doing time.